Health Republic was the little company that was supposed to shake up the insurance market. It certainly did. Health Republic Insurance of New York was an instant hit when the Obamacare rollout began in October 2013—and that was no fluke. Executives at the fledgling insurer had a two-pronged marketing strategy to ensure its popularity: They would offer very low premiums and a choice of New York's top hospitals at a time when competitors were shrinking their networks of doctors to hold down costs. The low premiums attracted a crush of members, including some of the sickest New Yorkers. On the first day that Health Republic offered coverage, in January 2014, five new enrollees were admitted to Memorial Sloan Kettering Cancer Center for expensive treatment. The insurer's costs skyrocketed. Demand for Health Republic and its services overwhelmed its staff of fewer than 25 people. Employees spent the first weeks glued to telephones, handling complaints from consumers and medical providers alike. Thousands of enrollees weren't properly registered and lacked ID cards, so medical care and prescriptions couldn't be paid for. One distressed employee's panic attack ended with a visit to a hospital emergency room. Dr. Edward Anselm, the insurer's medical director at the time, took matters into his own hands. He gave aides his personal American Express card and told them to charge $30,000 in prescriptions to ensure that members had refills for critical medications. On Sept. 25, 2015, Health Republic was ordered to shut down by the same state and federal agencies that had given the insurer their regulatory blessings just two years earlier. In 20 months, from January 2014 through August 2015—when it became clear the insurer couldn't survive—Health Republic had accumulated tens of millions of dollars in losses. 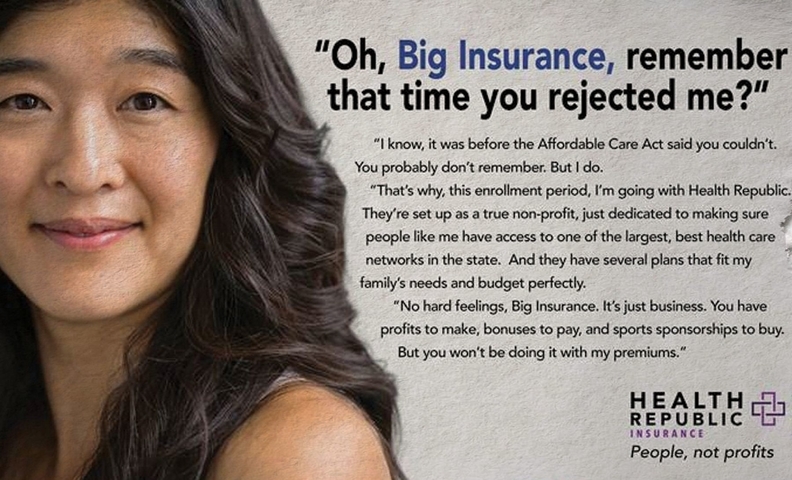 The company was ordered to close its doors effective Nov. 30, leaving 209,000 enrollees to scramble for new coverage. A three-month investigation by Crain's New York Business shows that, from its conception in 2012, Health Republic was on unsteady ground. Crain's found that management deliberately set low premium rates as a marketing ploy to attract customers. Regulators approved those rates but then wouldn't let the company raise them after it became clear that the prices jeopardized the company's solvency. Revolving top management, poor decisions made by inexperienced executives and inadequate services from outside vendors combined to sink the company, our investigation found. As well, a Republican-controlled Congress slashed federal funds created to guarantee that Obamacare insurers could survive their first years. Although Health Republic's demise received wide media coverage, little of the company's behind-the-scenes turbulence has been reported. Health Republic was born from the Obama administration's desire to offer an alternative to the big insurers that dominate this tough business. Anthem, Aetna, Cigna and Humana have sought mergers to sustain the profit growth shareholders expect. To introduce competition in regions where consumers had few choices, the administration funded the creation of nonprofit insurance companies, called Consumer Oriented and Operated Insurance Plans, or CO-OPs. Nonprofits without quarterly-earnings pressure, the thinking went, would help meet President Barack Obama's goal of insuring millions more Americans. “There was this heroic hope that nonprofits run by consumers will provide a better alternative,” said Sherry Glied, dean of New York University's Robert F. Wagner Graduate School of Public Service. Obama's goal was shared by Sara Horowitz, a labor-rights activist and a 1999 winner of a MacArthur “Genius” Grant who has campaigned for employee-like benefits for millions of self-employed workers in the expanding gig economy. Horowitz, 53, is founder and executive director of Freelancers Union, a Manhattan nonprofit that provided low-cost health insurance for its 25,000 self-employed members in New York for five years, beginning in 2008. When Horowitz devised an ambitious plan to create a network of nonprofit insurers, there was ample reason to believe she would succeed. In early 2012, the Obama administration awarded Freelancers Union more than $517 million in low-interest federal loans to create Health Republic and two other CO-OPs. That money represented more than one-fifth of the total $2.4 billion in federal loans available to build all 23 CO-OPs. Federal rules allowed Freelancers Union only to “sponsor” the CO-OPs, not run them, after an initial two-year startup period. To set up the three CO-OPs, Freelancers Union turned to its own for-profit consulting unit, Independent Workers Services, paying it $25 million from the federal loans. With input from Horowitz, former employees said, IWS hired as Health Republic's interim chief executive Daniel McGowan, who had been president and chief operating officer of HIP Health Plan of New York until 2008. McGowan had helped write Freelancers Union's initial proposal in 2011 to sponsor the CO-OPs. But when he came on board as interim CEO in June 2012 and started making critical startup decisions, he did so only part-time and often worked from his home in Florida, staffers said. McGowan, who declined requests for comment, led the company during its transitional period before it was licensed as an insurer. But the decisions he made in collaboration with IWS and Horowitz had a profound impact on the future of the company, its members and the doctors and hospitals that provided care. Under New York's “prior-approval” law, insurers must submit premium requests to the state's Department of Financial Services, which has the power to adjust the rates that will be charged to consumers and small businesses. To determine their premium costs a year in advance, insurers turn to actuaries. These forecasting professionals rely on computer models that factor in data about existing members. That information is used to predict enrollees' use of medical services and how much money an insurer can expect to pay health-care providers. “We have years and years of experience in pricing our products,” said William Golden, head of northeast operations for UnitedHealthcare, a national insurance giant. “Too high, you price yourself out of the market. Too low, and the business isn't profitable.” He added: “It's absolutely critical to get it right." Golden said predicting rates was a challenge for all insurers in Obamacare's first year. The Affordable Care Act was created to attract the uninsured—a group about which there was little data. So in 2013, IWS hired Milliman, a national actuarial firm, to help Health Republic calculate its first-ever premium request to the state. To arrive at prices, Milliman used data from MagnaCare, a health-services company whose network of doctors and hospitals Health Republic planned to use for its members. But then McGowan and his small management team made what proved to be a fateful decision: The prices they submitted for approval were lower than the prices their actuaries suggested by a significant amount, several former executives acknowledged in interviews. “It was purely a marketing ploy,” said one. The Department of Financial Services said the state was unaware Health Republic had undercut Milliman's suggested premiums simply to entice business. When DFS published its approved premium rates, Health Republic's were the lowest by far. 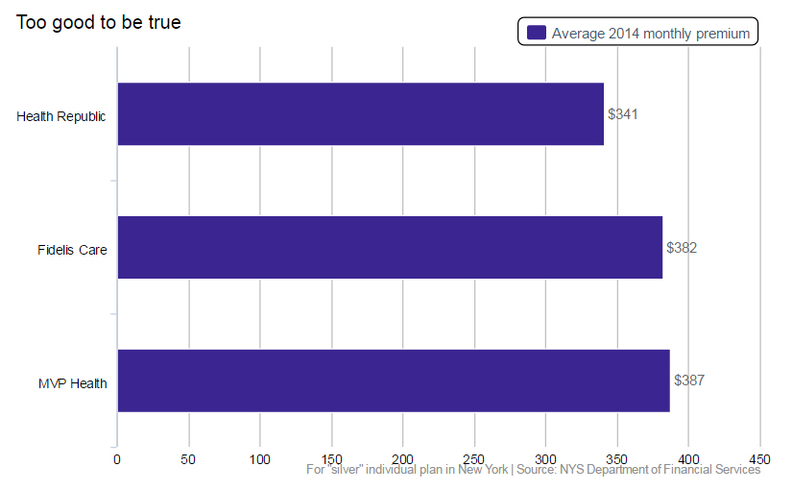 City small businesses that bought its popular “silver” plan paid $408 a month. The next lowest price was MetroPlus Health Plan at $423, while Oxford Health Plans charged $566.Health Republic's rock-bottom prices perplexed industry veterans such as Golden. “How can one company be so much cheaper than the rest?” was Golden's immediate reaction. Like Health Republic, UnitedHealthcare had set premiums for the new health plans created under Obamacare. It tracked fees that its competitors negotiated with hospitals and doctors and used its own historical data to project the cost of medical services for new Obamacare enrollees. Based on UnitedHealthcare's calculations, Golden believed that Health Republic's premiums were insufficient to cover its likely medical expenses. Losses were inevitable. Health Republic's marketing scheme worked better than expected. The combination of low premiums and MagnaCare's broad statewide network packed with prestigious New York hospitals “was a principal selling point” to customers, said Thomas Sackman, a Westchester insurance broker who saw 70% of his individual and small-business clients sign up with Health Republic. Sackman was only “slightly” concerned that it was a new insurer. 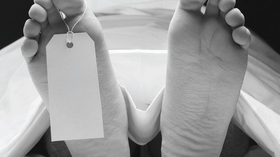 The decision to use MagnaCare's network proved to be an expensive selling point. As a startup, Health Republic had no prior relationships with New York's hospitals and doctors, unlike established insurers that contract directly with providers. Both Health Republic and Oscar, a Manhattan insurer that also launched to sell Obamacare plans, “rented” MagnaCare's provider network, which more typically was used by insurers to provide services in localities with few subscribers. By relying exclusively on MagnaCare's network, Health Republic paid providers more than competing insurers. MagnaCare declined to comment. Renting a network made sense at the time. But it meant high operating costs for Health Republic and Oscar—a fellow startup, but one that has raised $727.5 million in capital and has a $2.7 billion valuation. Mario Schlosser, Oscar's chief executive and founder, told Forbes recently that the insurer's costs in New York would fall once its expensive MagnaCare contracts expired. The Department of Financial Services approved Health Republic's rates in July 2013, and shortly thereafter, the company made several changes at the top. In consultation with Horowitz, staffers say, Freelancers Union's IWS replaced McGowan with a new CEO: Debra Friedman, a Medicare specialist who had never run an insurer. Her base salary as CEO was $392,736 in 2014, far less than the heads of for-profit insurers. Over the next two months, Friedman, who did not respond to interview requests, made a number of management changes that former staffers say destabilized the company. She fired Health Republic's chief operating officer and its vice president of market research, telling other executives that the two lacked business experience. In its short life, Health Republic had two chief financial officers; the first one told others that he resigned because he lacked the experience to manage the finances of the large business Health Republic had become. The insurer also had two medical directors, a position critical to managing plan design and interactions with health providers. The post went unfilled for 12 months. By August, one month into her new job and two months before New Yorkers could begin enrolling in Obamacare plans, Friedman realized the insurer had set itself up for disaster, former staffers said. She asked DFS to let Health Republic refile its rates. The regulator refused. Troy Oechsner, the agency's deputy superintendent for health, said changing approved rates would be akin to having a closed bid and then letting one bidder change its offer after all the bids were made public. Friedman's fears were realized when enrollment opened. Within hours, staffers said, almost 30,000 people signed up for Health Republic—the projected enrollment for all of 2014. The avalanche of members overwhelmed the vendors that had been recommended by IWS. The vendors were hired to handle medical claims adjudication and customer service, functions that are at the heart of an insurer's interactions with customers. But these companies had never managed such services for a health insurer. A provider of employee-benefits services, POMCO Group of Syracuse, handled medical claims. A Canadian human-resources and retirement-benefits-planning firm, Morneau Shepell, ran customer service. Their inexperience became a hindrance, insiders say, when enrollment skyrocketed beyond the contracts' specifications. After Health Republic coverage began in January 2014, members inundated DFS with complaints about missing identification cards and inaccurate member addresses. Customer calls to the insurer's vendors went unanswered. Doctors who were owed money struggled to get paid. POMCO said that, given that Health Republic's enrollment far exceeded projections in the first three months, it “responded aggressively” and hired more than 100 people within six months to meet demand. As 2014 wore on, Health Republic's costs outpaced revenue. The insurer “was essentially blind” to how high costs ran, one staffer said, and as a result the 2014 data in financial reports to the state contained cost estimates that turned out to be “especially optimistic.” Those reports are now being investigated by state officials. Established insurers have in-house systems to closely monitor provider claims, but Health Republic relied on vendors to collect, analyze and report cost data. It took more than a year, staffers said, for those vendors to give management an accurate picture of expenses. Without knowing its true costs, Health Republic hired numerous new employees in 2014 and replaced others. Anselm, the medical director who charged prescriptions to his AmEx card, left that April. The company lured these new hires with salaries at the upper end of the industry. “It wasn't the kind of conservative management you'd expect from a nonprofit,” one staffer recalls. Many supporters of the CO-OP concept say Health Republic still might have survived if not for drastic federal funding cuts. Early Obamacare drafts had pledged $10 billion in grants to help the CO-OPs weather the first years of operation. But in the final law, the grants had been turned into low-interest loans—and totaled only $2.4 billion. Those changes alone, which came before any CO-OPs were operational, foreshadowed their likely failure. Republicans in Congress also gutted a critical financial backstop for Obamacare insurers: a three-year fund meant to insulate companies from the high cost of covering sicker, newly insured Americans. Health Republic's August 2015 state financial filing said the insurer expected to receive as much as $200 million from this “risk corridor” program, clearly enough to keep its business alive. In September, top management was stunned to learn the actual payout was about $19 million. The first to fall was Iowa's CO-OP, in December 2014. That failure raised alarms in Washington, where federal regulators began ordering audits of the finances of all CO-OPs. All told, 12 CO-OPs across the country shut down—including one in Oregon that was also launched by Horowitz—sending 740,000 Americans back to the marketplace to find new coverage. Oregon's CO-OP is suing the federal government, claiming CO-OPs are owed as much as $5 billion from the original risk corridor program. 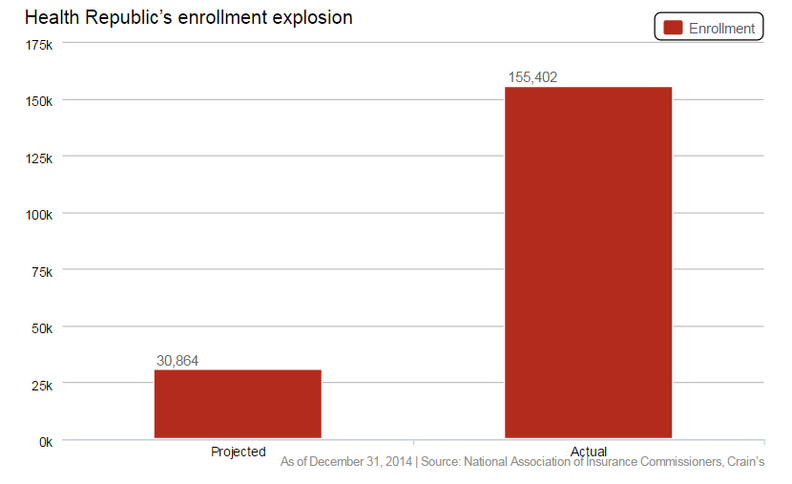 Obamacare insurers had originally expected a $2.87 billion payout but got only $362 million. Friedman tried to save Health Republic by seeking a capital infusion from banks and potential investors. But the Affordable Care Act blocks the CO-OPs from receiving private capital, a decision the Obama administration is now rethinking in light of the failures. 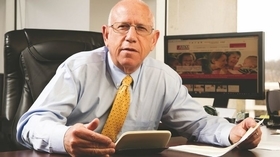 Robert Glazer's practice is one of many still owed money by Health Republic. “We feel betrayed,” he said. By several accounts, DFS did not monitor Health Republic closely, aside from handling initial consumer complaints. It wasn't until early 2015 that DFS began demanding monthly financial reports from Health Republic instead of only quarterly and year-end financial statements. By then, the company realized it had lost $77.5 million in 2014, an amount it had still hoped would be covered by the federal backstop. Meanwhile, Health Republic's executives tried to reduce losses. They stopped selling policies in several upstate counties where claims were particularly high. The company also tried to interact directly with providers to manage patient care that generated expensive claims but was blocked by the restrictive contracts that had been signed with MagnaCare. In May 2015, after 17 months in operation, Health Republic hired Nakomis Health of Minneapolis to conduct a rigorous review of medical claims handled by POMCO. Nakomis found $26 million in overpayments, according to a lawsuit the company filed against Health Republic in March seeking $4.8 million in fees. DFS began threatening to shut down Health Republic, but the company argued it would be solvent through 2016 if only its risk corridor funds came through. When the federal government told New York in early September that the insurer would get only 13% of its expected funding, DFS moved quickly. “Health Republic had to cease operations,” Oechsner said. The company was ordered to shut down by Dec. 31. That date was soon moved up when an October follow-up audit showed the company's finances were “substantially worse” than first identified, Oechsner said. The audit uncovered other “discrepancies” since Health Republic's previous financial report. Unwilling to wait until the end of the year, the state shut down the company Nov. 30, leaving 209,000 Health Republic clients to find new coverage. Those financial inconsistencies prompted DFS to announce it would investigate Health Republic. Health Republic's top management cited the investigation as the reason it couldn't comment for this article. Several former staffers said executives told them not to speak to the press. The insurer's office in downtown Manhattan shut down in November and its assets, if any, are being managed by the restructuring firm Alvarez & Marsal, which didn't return calls for comment. Horowitz has deflected responsibility for Health Republic's collapse. The CO-OP's management team, Horowitz said, was responsible for the decisions that led to the insurer's downfall. She said Health Republic's management was wrong to set low premiums that overwhelmed the company. She had a role in hiring both CEOs, and Freelancers Union's IWS unit provided consulting services in 2012 and 2013—when disastrous decisions were made. But Freelancers Union also said that IWS had recommended using a less expensive network. And Horowitz blamed crippling funding cuts by congressional Republicans led by Florida Sen. Marco Rubio. Regarding the current state investigation, “the company allegedly misrepresented its numbers to DFS,” Freelancers Union said in a statement. “Officials are right to demand answers and hold any wrongdoing accountable.” Feeling the fallout It's been decades since a New York health insurer has cratered so dramatically. Providers told Crain's they signed contracts to treat Health Republic members because they assumed the insurer had been fully vetted by the state. The Cuomo administration had even issued press releases in 2014 and 2015 crediting DFS' oversight as evidence of the state's role in keeping premiums affordable. “We feel betrayed,” said Robert Glazer, chief executive of ENT and Allergy Associates, a large medical practice with 173 physicians. The only warning signs of trouble were early last year, when Health Republic delayed claim payments by three to four months. At a forum held at the state Senate earlier this year, insurers and providers argued that DFS should have known Health Republic's rates were unsustainable. DFS's Oechsner said Health Republic's actuary, Milliman, certified that the proposed rates were “actuarially sound.” He added that because the Obamacare marketplace was new, there were many “uncertainties” related to all the insurers' rates. But those uncertainties were supposed to be offset by the promised federal funds. Hospitals said Health Republic owes them an estimated $200 million in unpaid claims, including $22 million at Northwell Health and $4.8 million at NYU Langone Medical Center. Northwell Health (formerly the North Shore-LIJ Health System) filed a lawsuit in November seeking damages in excess of $15 million, plus interest and legal fees. Additional reporting by Jonathan LaMantia. This article was written with the support of a grant from the Urban Reporting Program of the CUNY Graduate School of Journalism. "The short and chaotic life of an Obamacare darling" originally appeared on the website of Crain's New York Business.